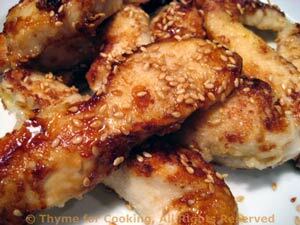 Chicken Sesame Stir-Fry, Thyme for Cooking simple dinner. I just do one, just to have a little something on the side with the Egg Fu Yung. Cut chicken breast into 4 - 6 strips. Put cornstarch and sesame seeds into plastic food bag. Add chicken and toss to coat. Heat oils and soy sauce in nonstick skillet over medium-high heat. Add chicken and stir-fry 7 - 10 minutes, until done. Serve with Egg Fu Yung. Keep warm in the oven along with the Egg Fu Yung until ready to serve.